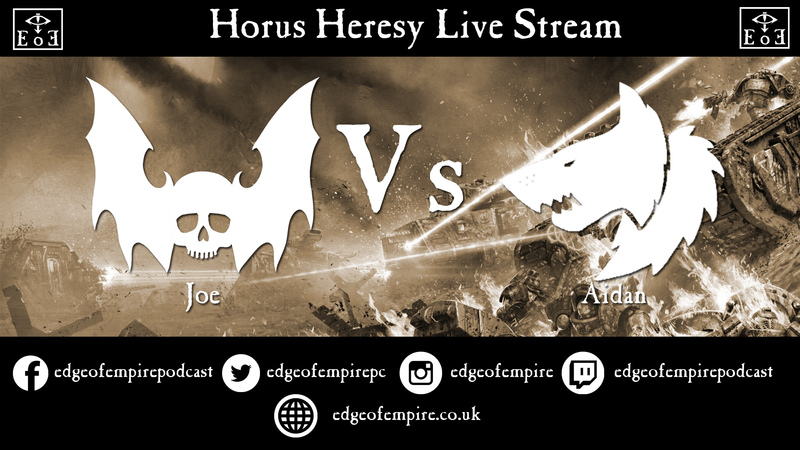 On Tuesday at the regular Durham Raiders club night I meet up with my fellow host Graham for a practice game before the Company of Legends Horus Heresy Weekender. 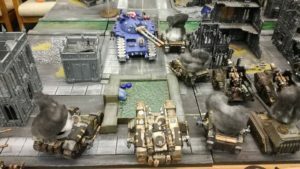 Graham plays Iron Warriors and really likes his tanks, he plays an Armoured Breakthrough list most of the time, and I have always struggled against it with my Ultramarines. 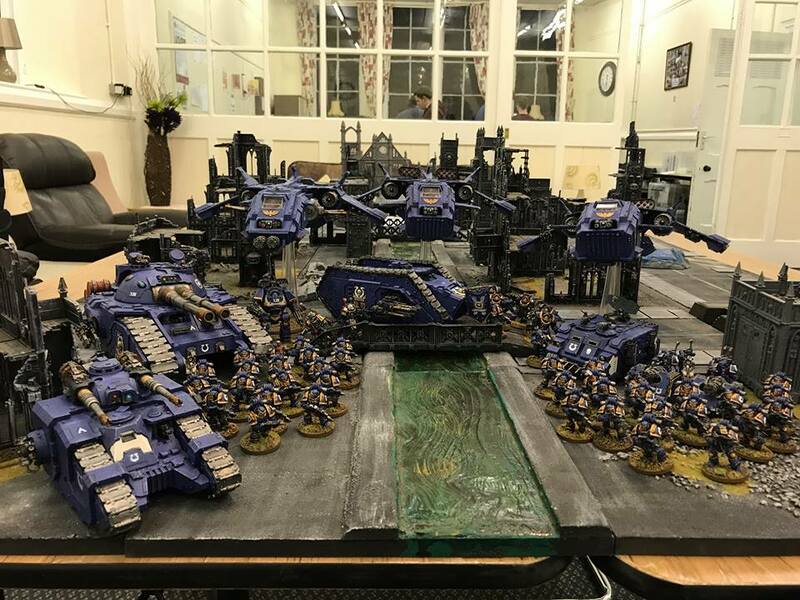 For the weekender I have decided to take a list based around two big units of Tactical Marines in Storm Eagles along with a Damocles Command Rhino and Remus Ventanus to give me a +1 to my Reserve Rolls and a reroll whilst adding +1 to my opponents Reserve Rolls. I have also thrown in a unit of Terminators in a Spartan, a Sicaran, a Fellblade and a couple of Rapier Quad Mortars for good measure. Going into the game I was convinced that I would get steamrollered by Grahams tanks, but the actual game was very different to how I thought it would turn out. We rolled a dice for the mission and we ended up playing Blood Fued, he chose Flyers as his special target, and I obviously chose Tanks! Of course Graham has a Sicaran Venator and knowing how this can screw up my Fellblade, I decided to take a risk and park my Fellblade opposite it and hope it wouldn’t be able to get me until I got my turn to fire at it and try to destroy it. Graham had won the initial set up roll and depolyed first, but shockingly for me I managed to Steal the Initiative, the first time in about two year that has happened! So I went first and pumped both Quad Lascannons and almost everything from my Fellblade at the Sicaran Venator, and I managed to blow it up and take some Hull Points off some of his Predators and a Medusa with the Orbital Bombardment from my Damocles Command Rhino, the game began quite well for me! In his turn he did destroy my Sicaran and both my Quad Mortars, but everyshot he made at my Fellblade pinged off it, and in my second turn I brought on my Storm Eagles and Fireraptor and managed to destroy more tanks and take some Hull Points off his Fellblade. He then managed to shake one of my Storm Eagles, destroy a sponson of the Spartan and take off half of the hull points of my Rhino, but the shaken Storm Eagle then used the Machine Spirit to take out another of his Sicarans. We had to do a bit of reading up for that, I was certain that the Machine Spirit allowed a vehicle to fire at full Ballistic Skill even if the vehicle was restricted to Snap Shooting, whereas Graham was convinced otherwise. So there we were going through the FAQs to figure out who was right, I suggested that we simply roll off for it, but Graham, being the rules stickler he is wanted the right answer. Thankfully for me the FAQ clarified that my interpretation of the rule was correct, but that is something we will look at in the next podcast episode. I also managed to kill off his artillery with my Fellbalde and his last Predators along with destroying his Master of Armour with my Fire Raptor. In his turn he shot down the Storm Eagle carrying Remus Ventanus, killing off all but five of the Tactical Squad it was carrying, he then got his Plasma Support Squad and Tactical Squad out of their Rhinos who proceeded to finish off that squad. My Fire Raptor then moved into hoover mode where it took a few pots shots at the Fellblade, which took off a single Hull Point, but were able to wipe out his Tactical Squad. My Contemptor Mortis also managed to do something for the first and only time in the game when it took out Grahams Lightning. Graham then used his Fellblade to take off the remaining Hull Points of my Fellbalde, and shot my last Storm Eagle out of the sky with his remaining Sicaran, which killed all but three members of that Tactical Squad out. 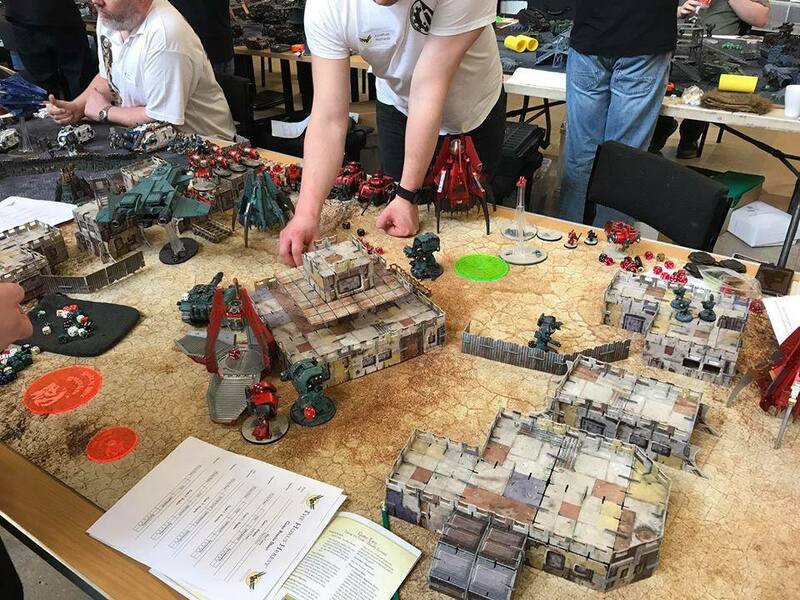 I then used my last turn to use my Fire Raptor to kill off the last of his Plasma Support Squad and their Rhino, whilst sending in my Terminators to finish off the Tactical Squads Rhino. In Grahams last turn he used his Sicaran to kill my last two Terminators and tried to take out my Spartan which he failed to do but he did finish off my Fire Raptor. 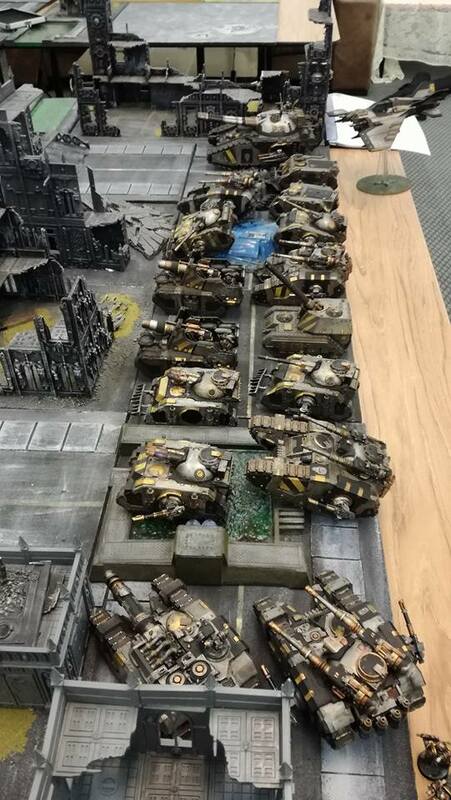 At the end of turn five, all I had left on the board was the Spartan and Damocles Command Rhino on just 2 Hull Points, the Mortis Contemptor Dreadnought with all its Hull Points and a single Tactical Marine. Graham had a Sicaran with all of its Hull Points and his Fellblade with 4 Hull Points. 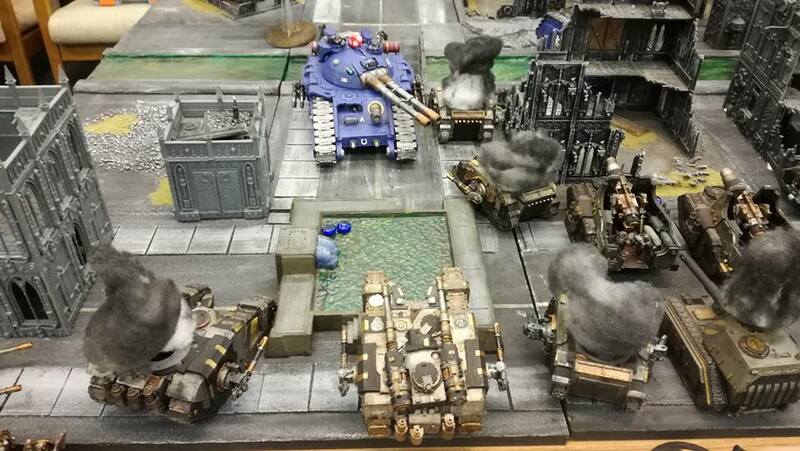 The end result was that I won 31 points to 14 points all thanks to picking Tanks as the unit to get extra points from. 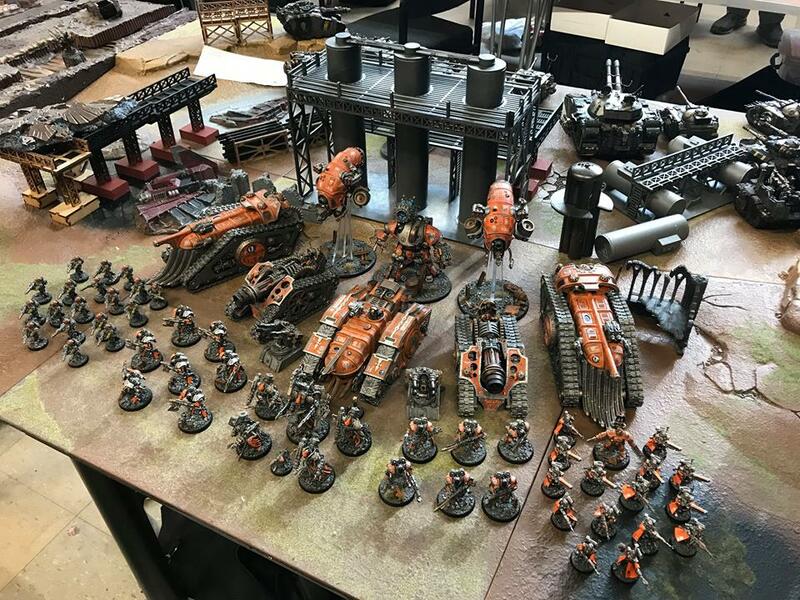 It was a really tough game and I am very thankful that my list was able to stand up to one of the toughest lists out there,and it was a good game, I got to learn a little bit more about how my list can stand up for itself and that as awesome as the Quad Mortars are, they just don’t do it in this list. Oh and here are the lists we played if you are interested by the way.